Stainless Steel Cable Ties, Packaging Size: 100 Nos. Leveraging the skills of our qualified team of professionals, we are instrumental in offering a wide range of SS Cable Tie. A comprehensive range of Stainless Steel Marking System is available for effortless and permanent identification of cable assemblies or ducting system, even in harsh environments. The system can be applied with Roollerball or Ladder Type Steel Ties. 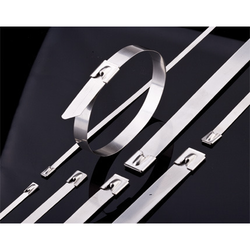 Upon request, we can also supply Rollerball Type Steel Ties with customized marking. - Giantlok's stainless steel ties are designed to secure hoses, cables, poles, pipes, and more when harsh environmental conditions may adversely affect the bundling application. We have been able to serve our valued customers with a wide range of cable ties. 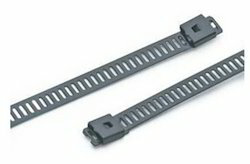 These cable ties are available from us in different grades and dimensions as per the requirements of our clients. Our range is manufactured by using high grade raw material that ensures their durability and highly acclaimed by the clients for their expansive applications and reasonable prices. In order to keep pace with never-ending demands of the customers, our company is instrumental in offering Stainless Steel Cable Tie.